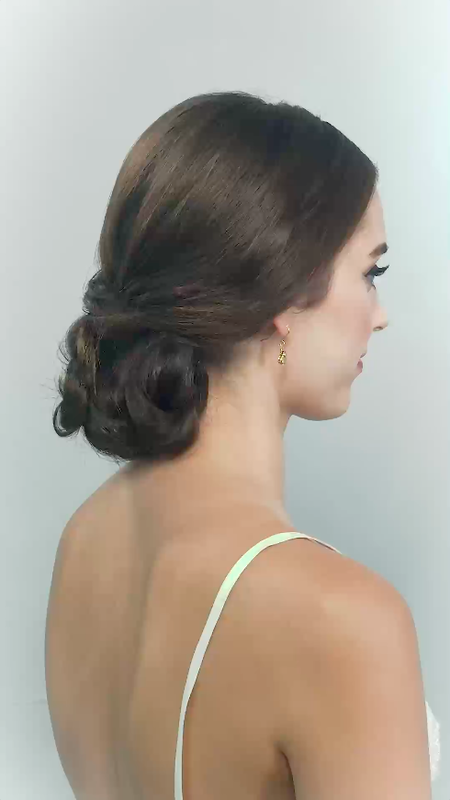 Whatever the length of your hair, an up do will bring those tressels up to showcase your gown and neckline. 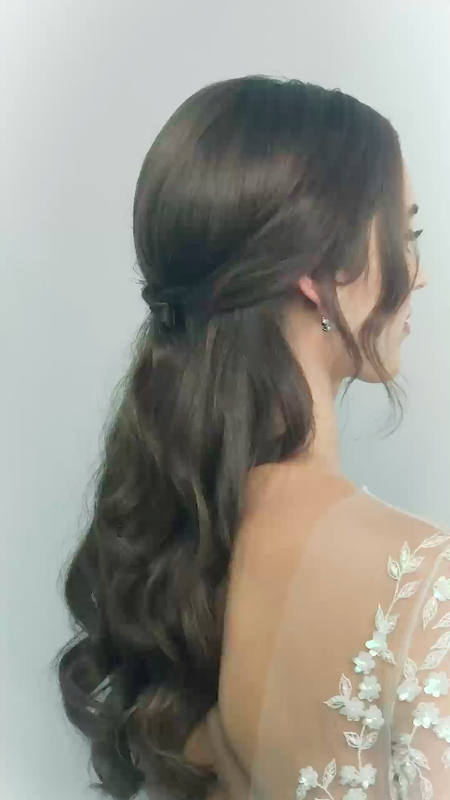 If you have an open back or a dress with detail to the back, this style will surely be the winning wedding hair look. 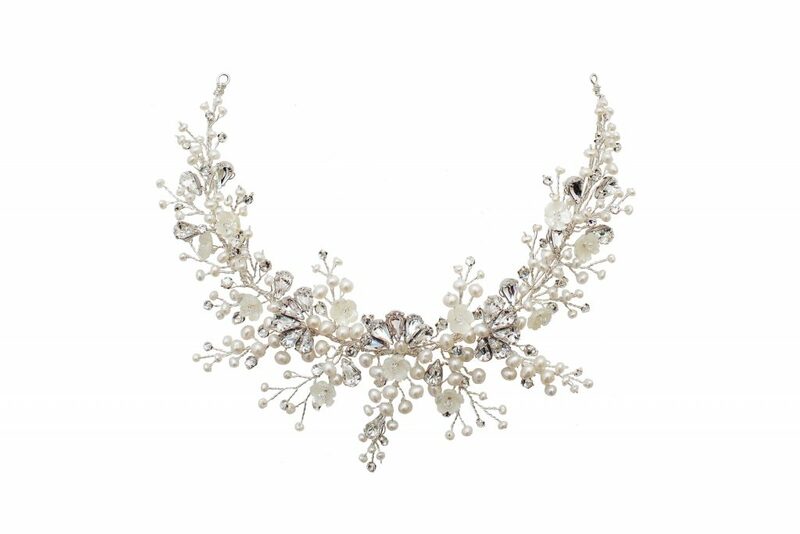 Your low up do is perfect to frame with a garland such as our Ariel Headpiece with detail to the back. 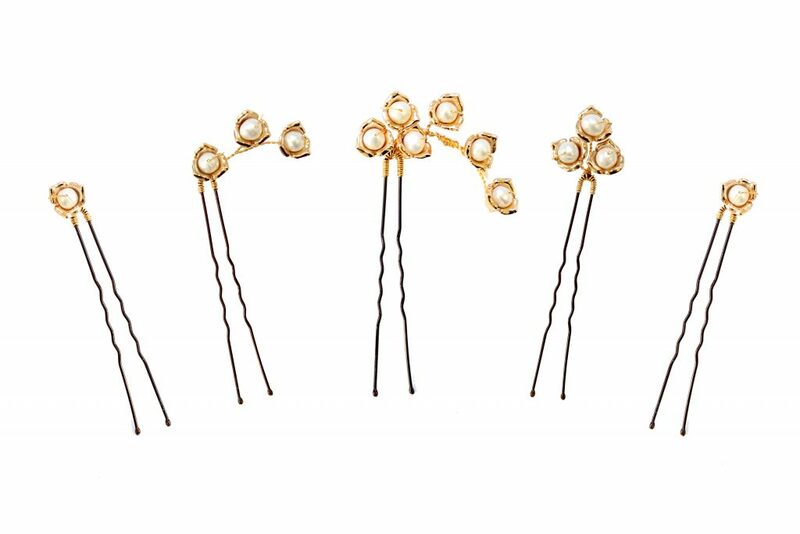 If you are a ‘less is more’ bride and want an elegant touch to your wedding hair, your simple up do can be updated with a range of our Reign Bud Hairpins. In varying styles and sizes, this collection is the perfect way to add a bit of luxe to your classic look. 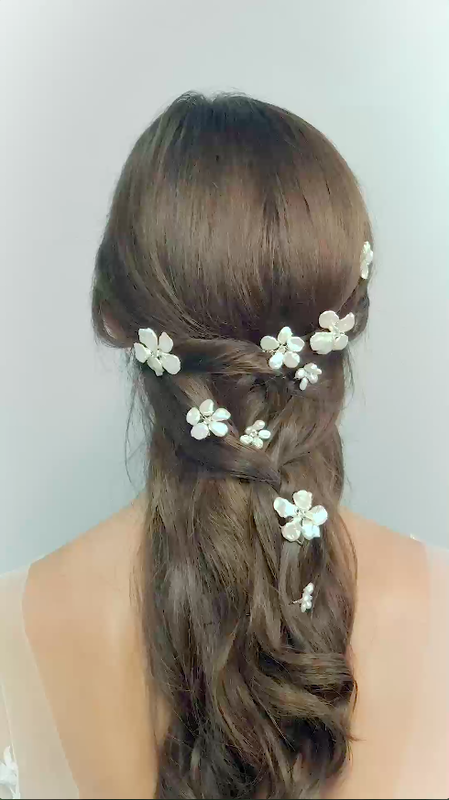 Hair up or down, this garland works wonders. 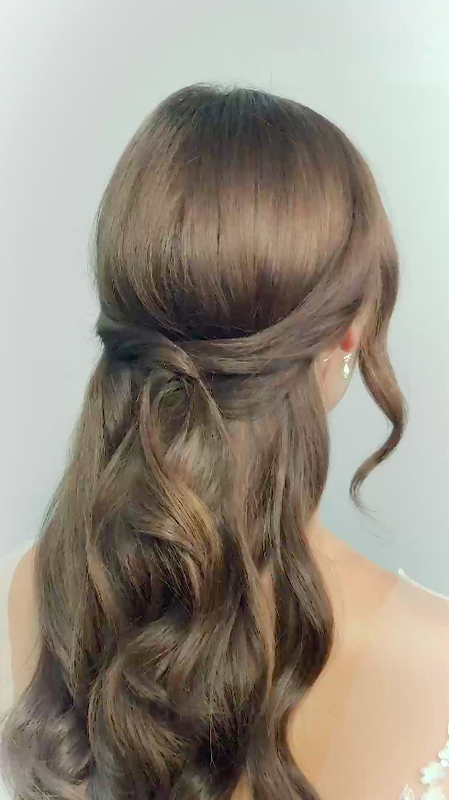 Wear your low updo during the ceremony and lunch, and let those waves loose for all your dancing in the evening! 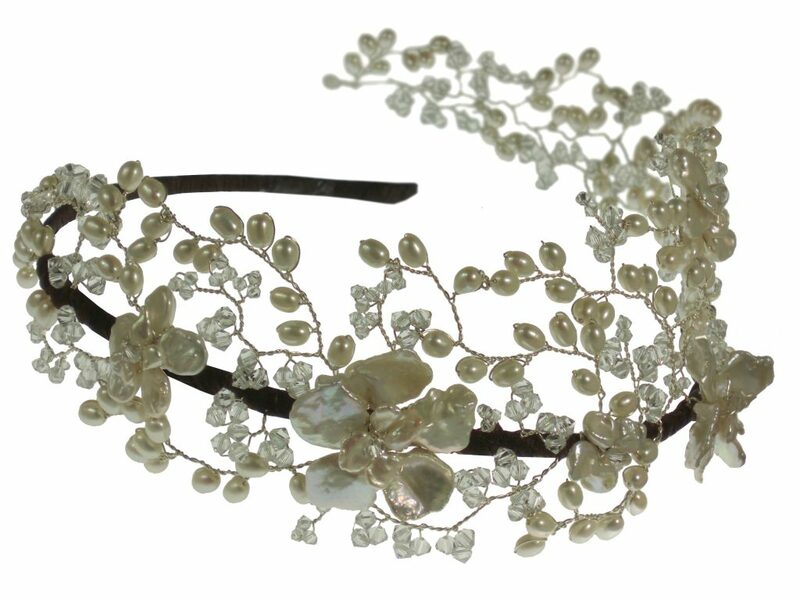 The Floriana Headdress has all the magic you need for this dramatic change throughout the day. 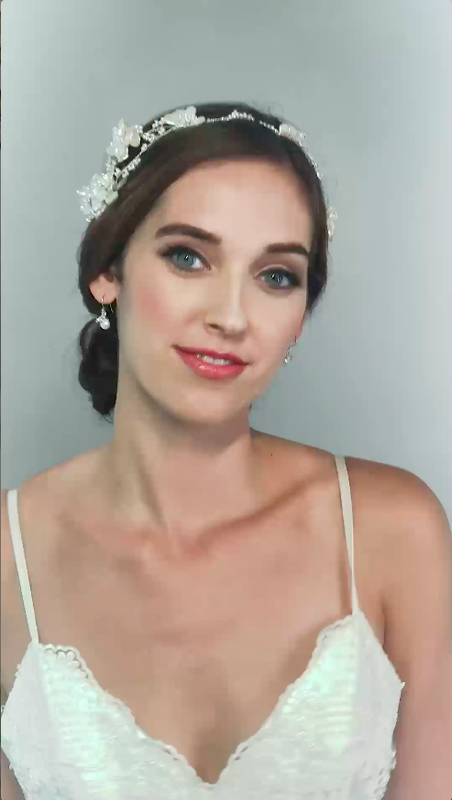 Add even more wonder and frame your bridal veil with a set of Floriana Hairpins! Oooooh! 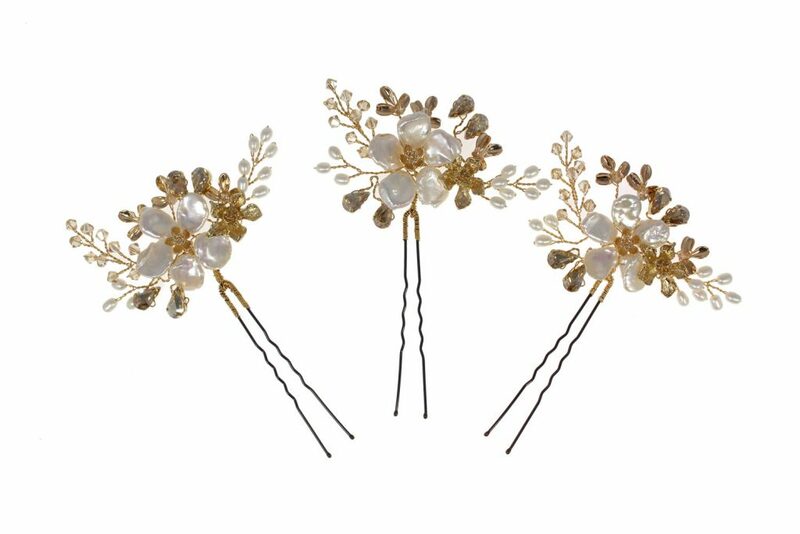 Available in ivory or a pearlescent blush pink tone, these gorgeous Blossom Hairpins work perfectly if you’re still unsure of your chosen wedding hair style. 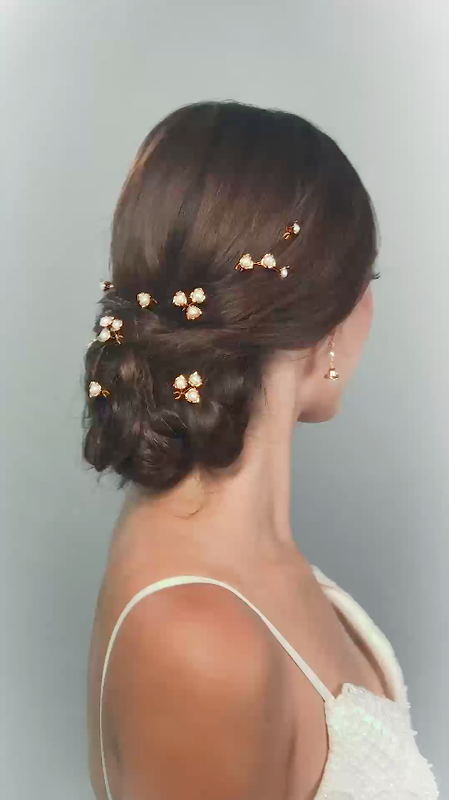 Pin through an up do or through loose twists for a more bohemian touch. They look so natural, and these flowers you can keep always and enjoy wearing time and time again. 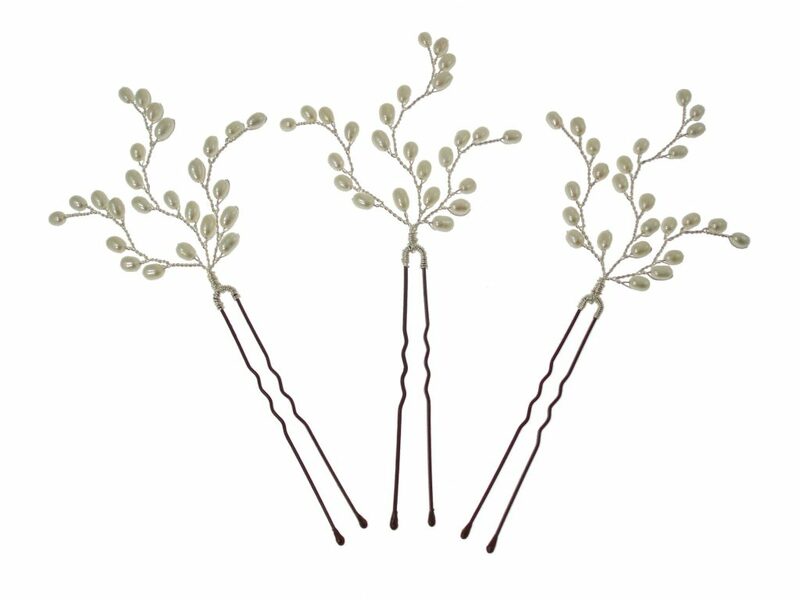 Available in 3 sizes, and as a pin-in for extra drama! 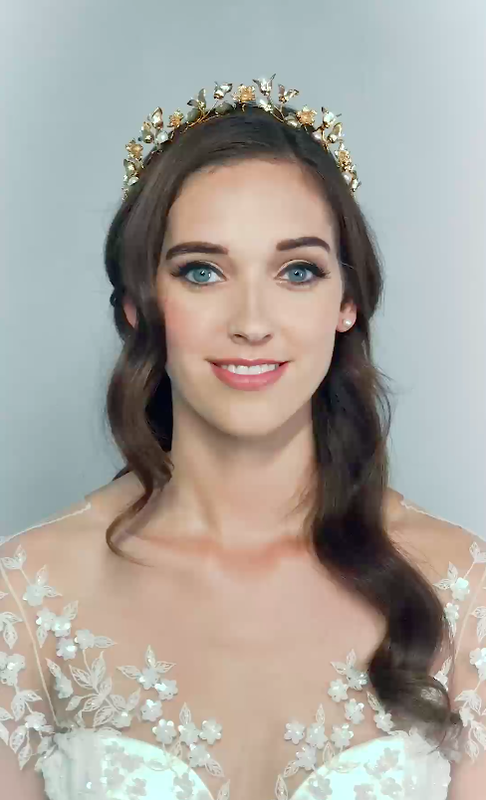 Add a tiara for the Princess finish. 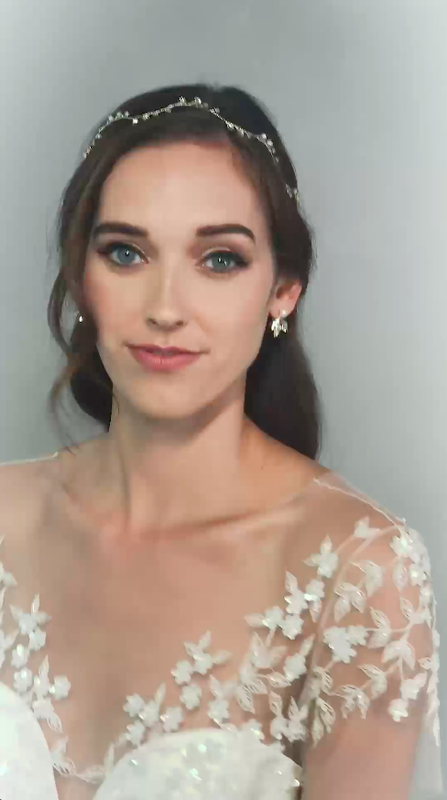 The classic half up, half down style works for almost every bride, whatever your style. 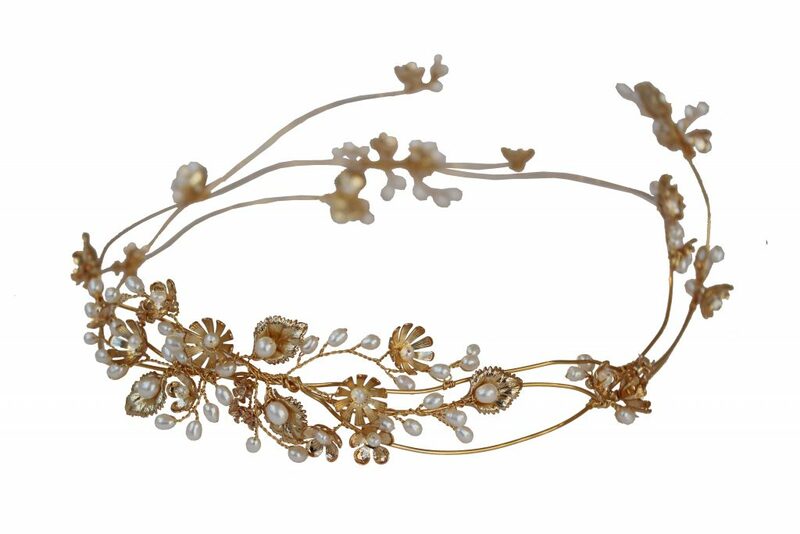 When minimal hair is pinned up, you are able to take your look one step further with our May Blossom Headdress. Her pearls, crystals and flowers create such a showcase. Take all your waves up to the back for ultimate sophistication, or leave loose to the side for more texture. 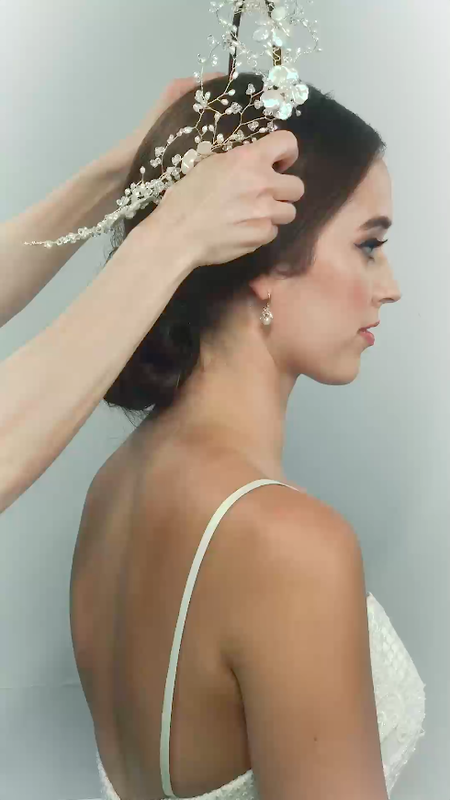 A simple hairvine to the front is perfect to add detail in your photos and your veil looks stunning from the back. 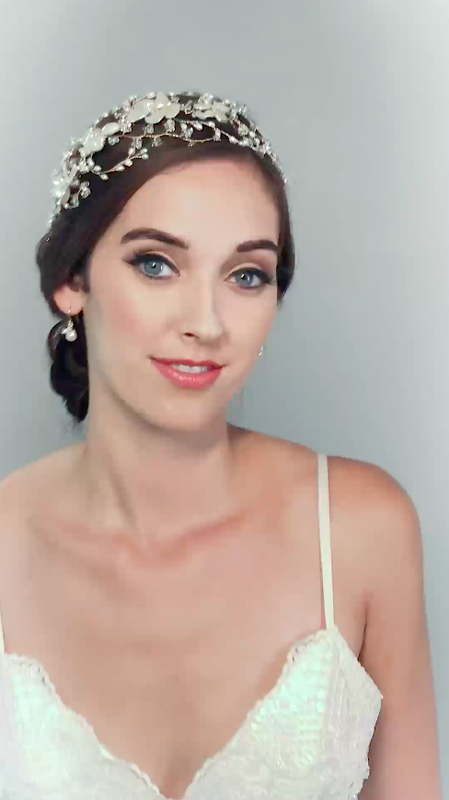 For the ultimate showcase, add our Cordelia Crystal Headpiece to the back. It frames that flowing veil beautifully. 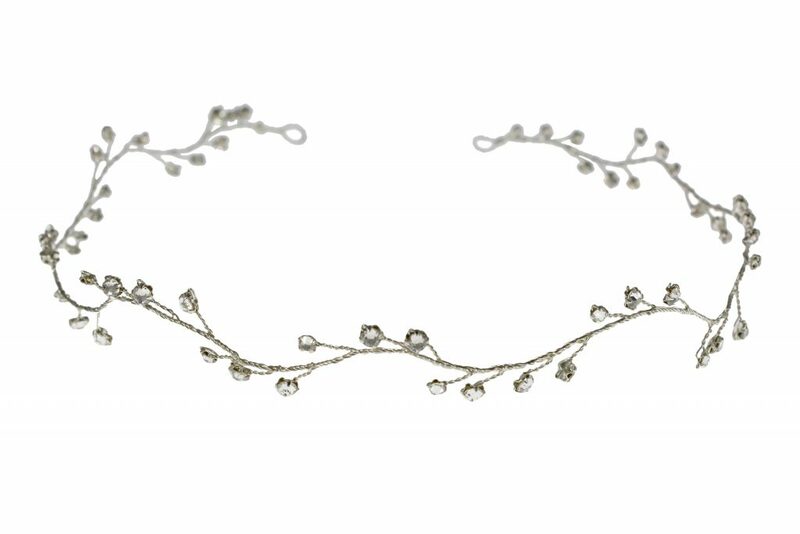 Add the Dewdrop Hairvine to the front for the twinkliest finish. 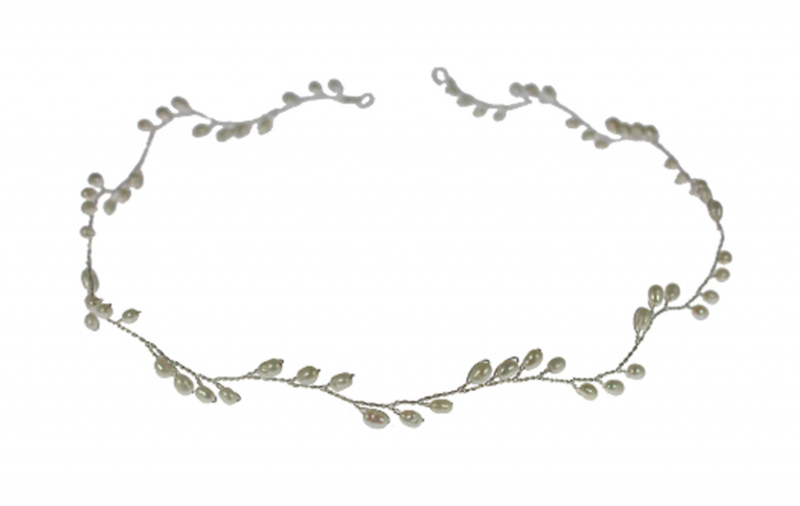 Available in gold and silver, and add a chain to wear on your honeymoon as a glorious necklace! 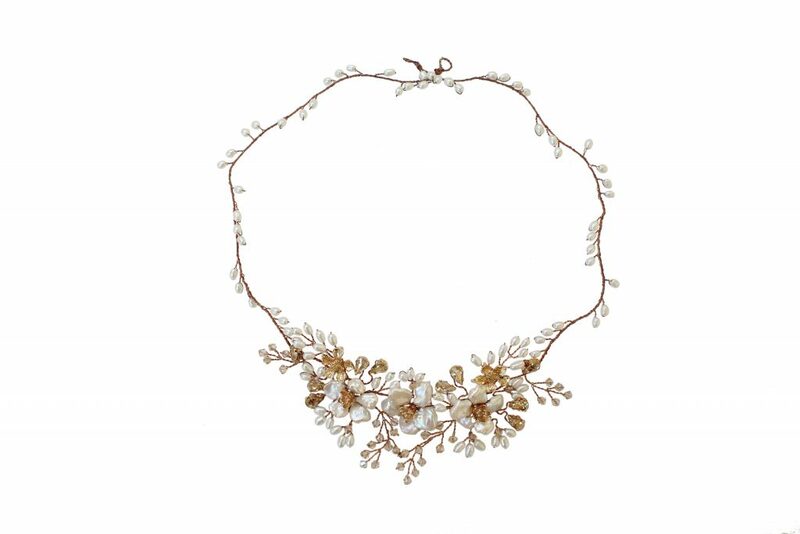 Delicate displays are key in Hermione’s work, and none so much than her Lily Collection. 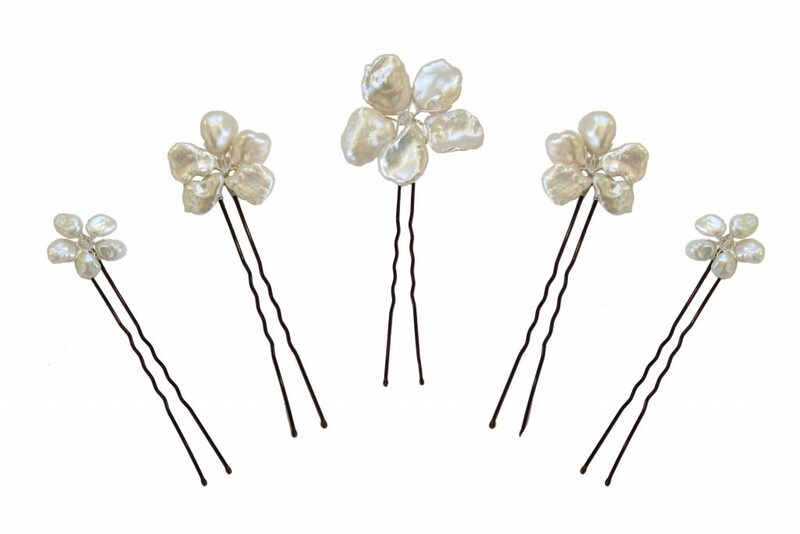 Simple hairvines of pearl in silver, or gold, wiring create beautiful hair decoration to add detail to a range of wedding hair styles, and are the perfect finish to a loose and more relaxed hairstyle. 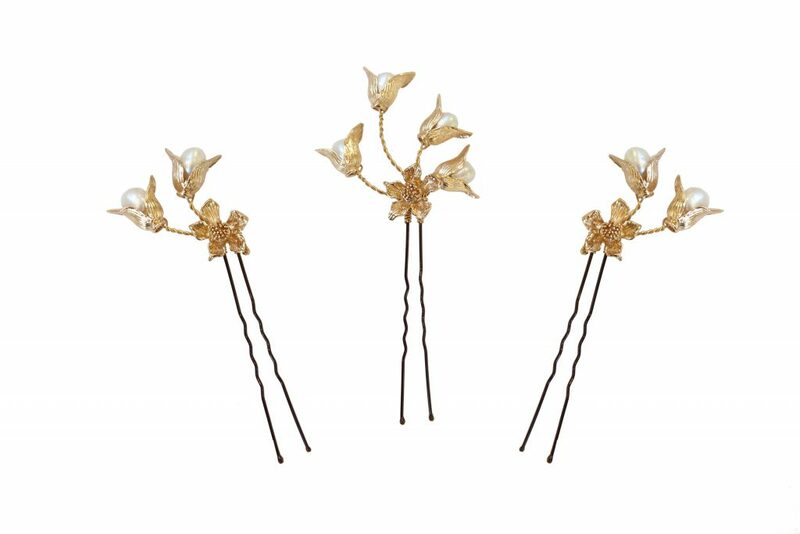 The Lily Hairvine can be taken to new levels with the addition of matching Lily Hairpins, as seen here. What a beautiful display! 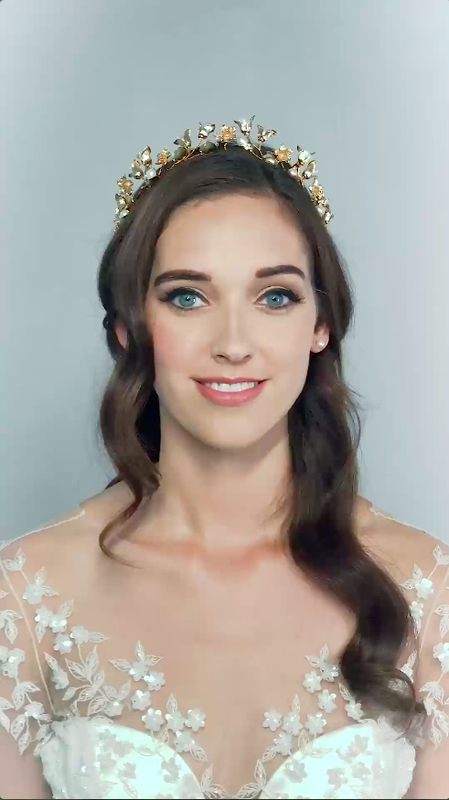 Let your locks loose with full or half hair down! With a simple twist and minimal pinning the options available to you are endless. 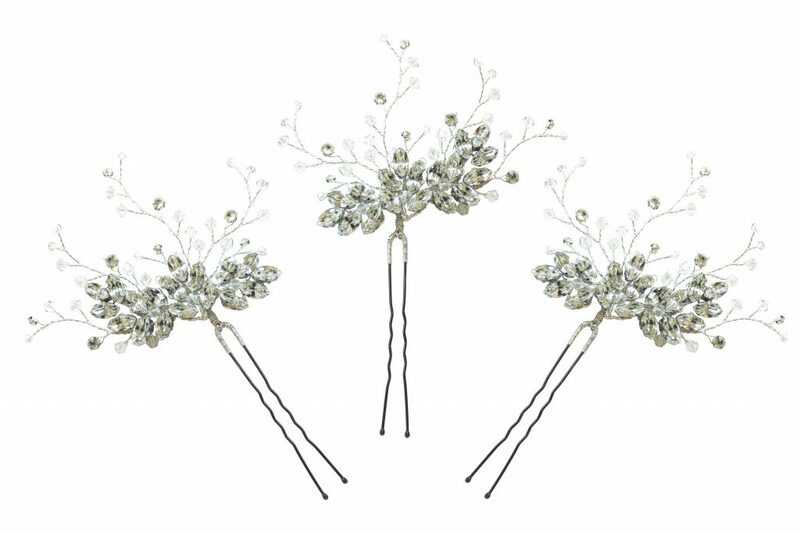 Add a headpiece with height for a gorgeous finish. 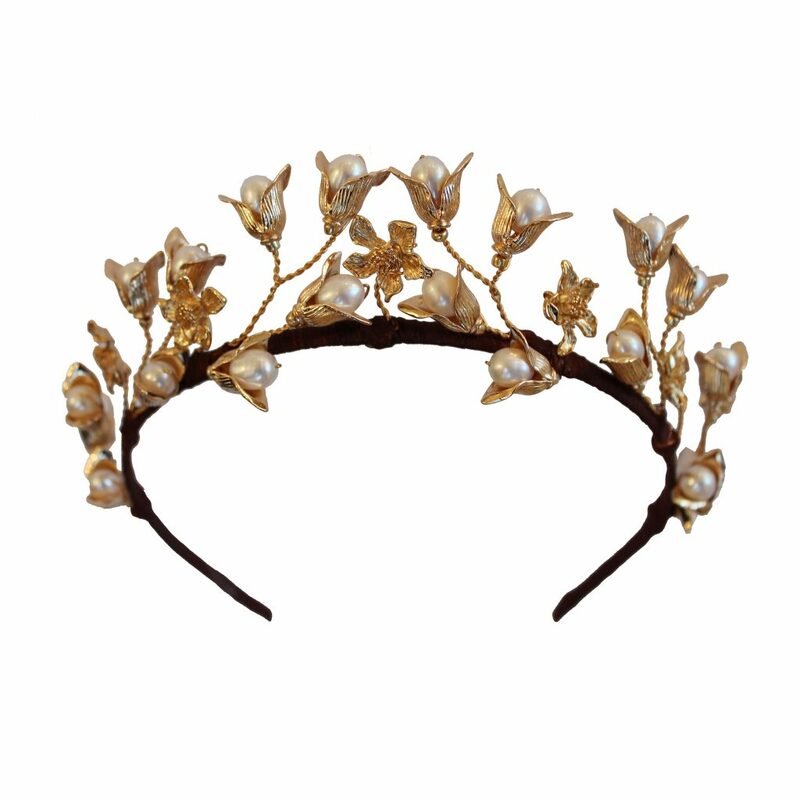 Our pretty Reign Crown isn’t your typical tiara, with golden vines reaching to Hermione’s famous freshwater pearls for a royal-worthy botanical halo. 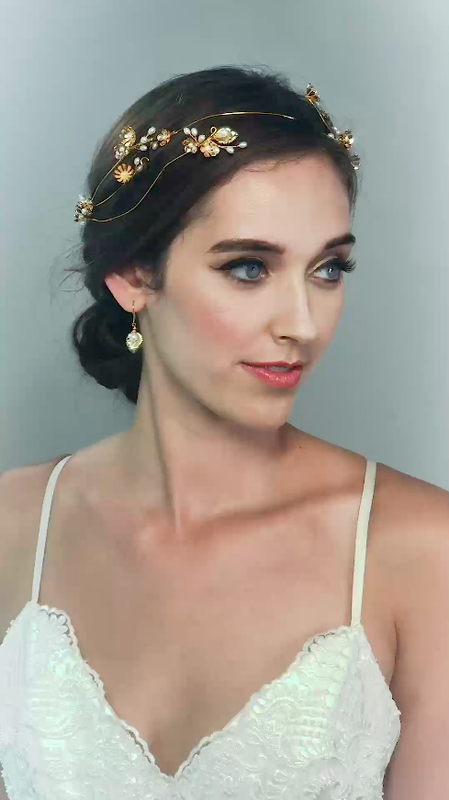 Sweep some hair back at the sides add your veil and complete your look with matching Reign Hairpins for all the class. 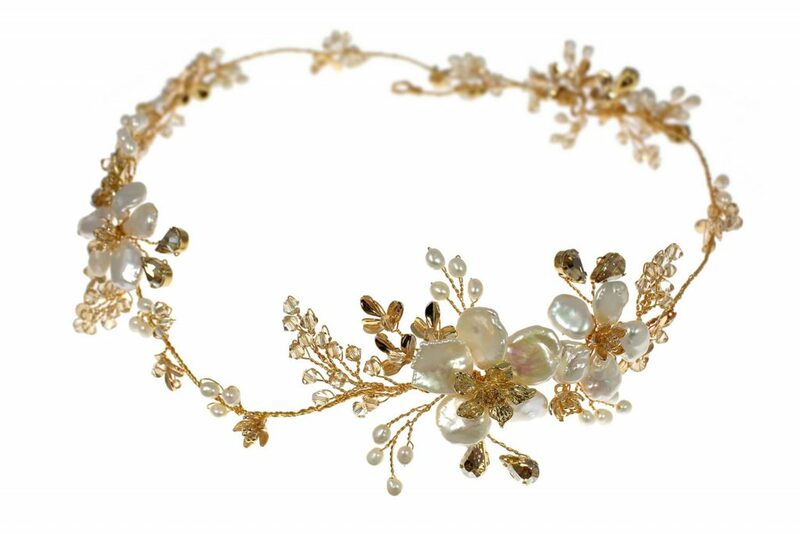 Whatever your wedding hair, for an accessory with all the glory and drama, a bespoke crown, like that of our Aphrodite Crown of pearls, will win the heart of your lover, and those of all your loyal subjects. 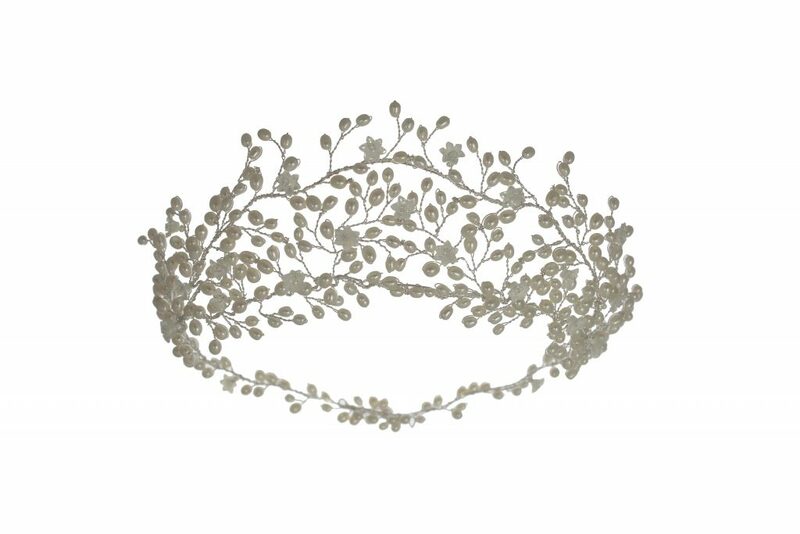 Top your crown with a veil for all the glory! 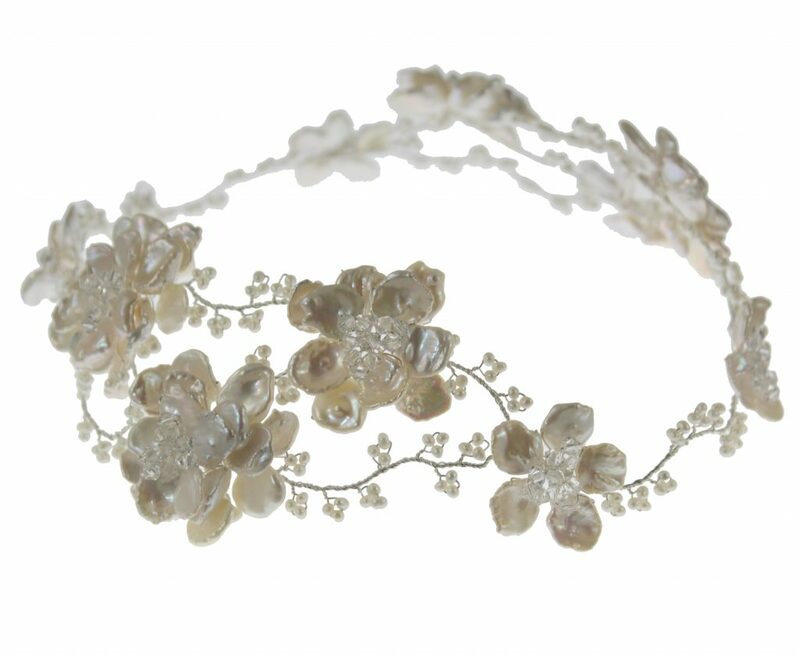 Award winning designer hair accessories and jewellery with exclusive locations in London and Bristol. 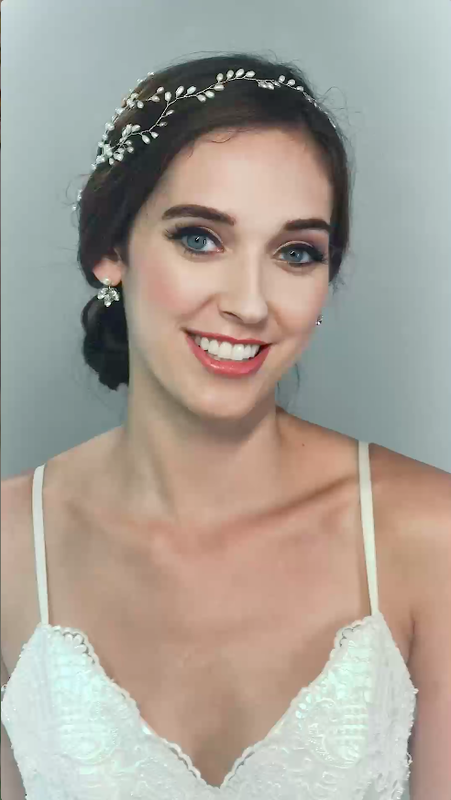 Vintage, bridal, classic hair styling for lessons, parties, hen nights, events, weddings, photo shoots and private appointments. 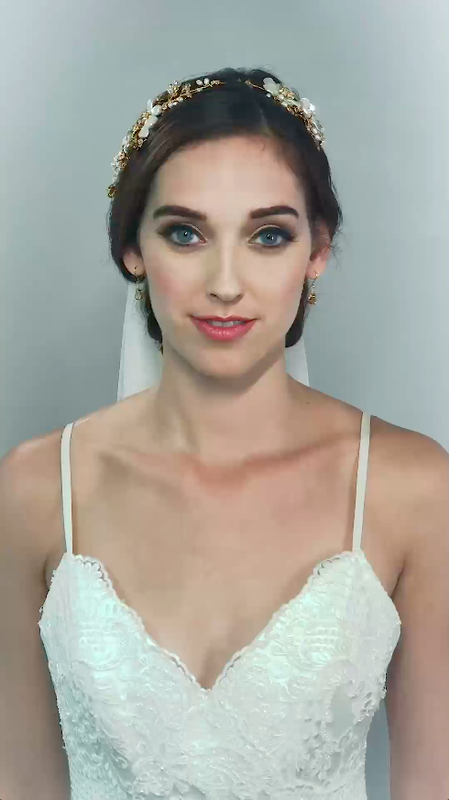 West London based professional Make Up Artist with over 6 years experience. 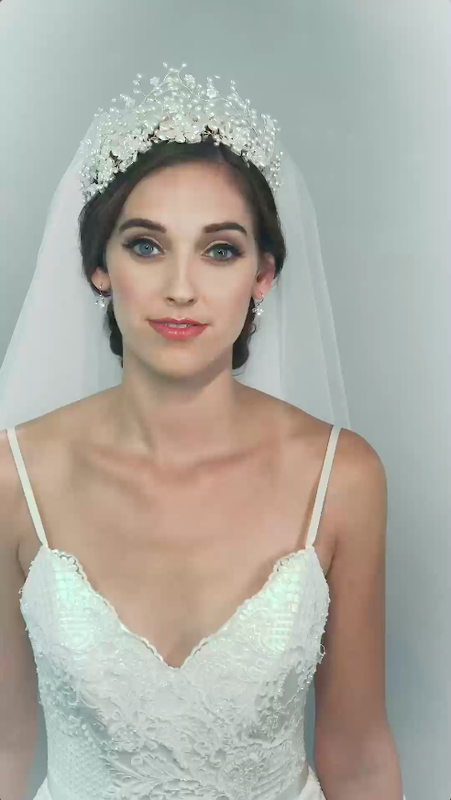 Specialising in television, commercial, film and bridal. British award winning fashion designers of evening wear, bridal gowns and couture wedding dresses with UK shops in London and Cheshire Manchester. 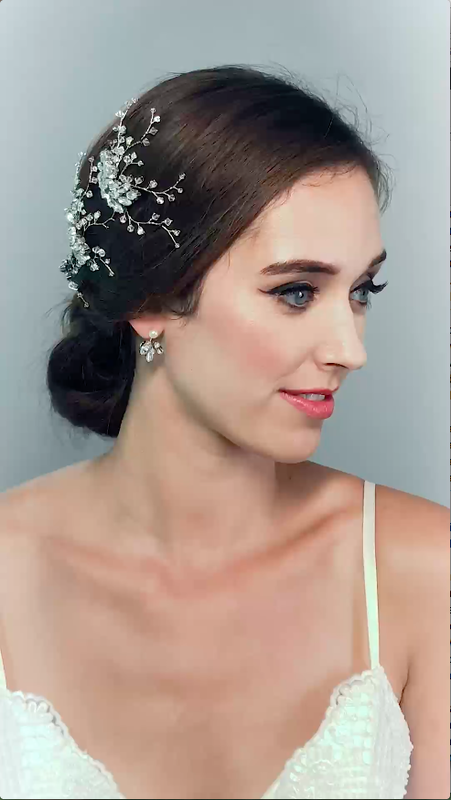 We know your bridal look is unique to you, so we would be delighted to welcome you to one of our showrooms to discover your very own wedding hair look. You can book HERE at your chosen boutique: no fee is applied for our appointments, simply show up on the day. There’s even a range for your honeymoon in our FASHION collections. Watch this space for more Accessory Heaven! Contact us on london@hermioneharbutt.com for all London and international queries and bookings.